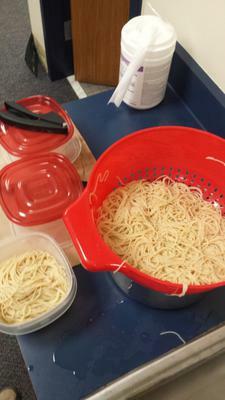 The SolSource cooked up the spaghetti with no problems! Today, we had clear blue skies and plenty of sun, so I decided to run a boil test. How quickly would this SolSource boil water? I spend a lot of time in the outdoors, and I imagine that a solar cooker would come in handy during any emergency situations, so water boiling data would be nice to have around. I decided to choose a large amount of water for boiling, since large amounts of boiled water would be necessary in an emergency situation. I looked at a package of spaghetti, which recommended 4-6 quarts (roughly 4-6 liters) of water. This seems excessive, since I am used to things like Quinoa, Couscous and rice, which consume all of the water that they sit in. I decided to pull double duty to make lunch for the rest of this week, as well as acquire some water boiling data. The water begins communicating with you almost right away - you can hear the transfer of thermal energy as soon as you place the pot in the focal point of the cooker. At 55, I looked out my classroom window to see water dripping onto the mirrors, indicating a rolling boil. Future plans are to be pick a time where I can afford some time to fine tune the process and get to-the-minute data. I would also like to get data for boiling 1L, 2L, 3L, and on up...perhaps get my students to graph the relationship for some bell work. The spaghetti turned out wonderfully - placed it in the boiling water for 8 minutes. 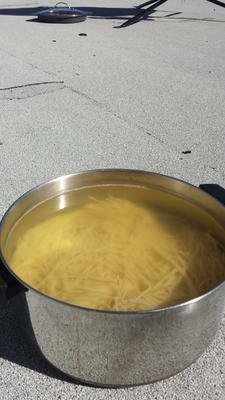 A fellow teacher poked her head out of her classroom window when she saw the steam coming from the pan. I'll be sharing this in the lounge tomorrow! Looks like you're having fun! Looks like fun! We have some videos coming out really soon I think you will like. That is a really cool experiment, and I love the idea for graphing the results! Cool that it can boil so fast, too! So yes - I boiled 4Quarts in ~55mins. Sounds like we are getting similar boil times. The amount of water seemed excessive because I generally make things like quinoa, cous cous or rice, which tend to absorb/steam all of the water when the dish is finished. There is obviously still quite a bit of water left over when you make spaghetti! Whoops! Sorry, I thought I put that in the write up, apparently not - I went with the suggested minimum (4L), and it was more than enough. For the curious, 4L is 1 Gallon. Again, prior to this experiment, I didn't cook much; this is a learning experience for me! You said the recommended amount of water for the pasta was 4-6 quarts, but you felt that was excessive. How much water did you end up using? 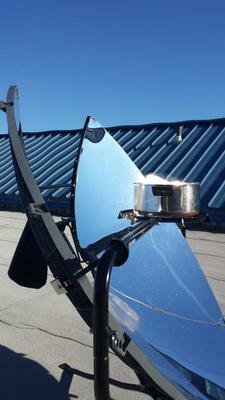 I use a Solar Burner and it will bring about a gallon of water to a boil in just under an hour.